LEVI SKI CENTER, KITTILÄ (Finland), 04 May 2018 - The 2018 FIM Snowcross World Championship has started at the Levi Ski Center in Kittilä, Finland. Hosting the fastest snowcross riders in the world, the Levi track is a combination of both fast and technical with an uphill start straight along with a downhill rhythm section. Levi Ski Center is a resort in the North part of Finland alongside the town of Kittilä it is known worldwide for winter skiing, amazing surroundings, and views of the famous Northern Lights. Today’s action hosted both Free practice and Qualifying for the Snowcross World Championship, the Women’s Snowcross World Cup, and the European Snowcross Championship. The event is a two day format with today’s practice and qualifying while tomorrow, Saturday the 5th of May, will host the championship races. 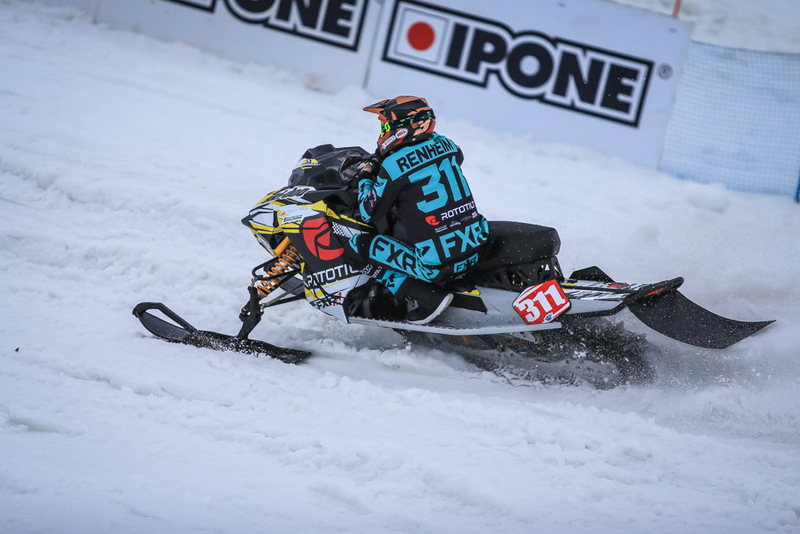 Snowcross riders from various categories such as 2016 and 2017 World Champion Adam Renheim will go all out for their chance to win the 2018 title. Renheim came out swinging today in the World Championship class and topped the Qualifying times of both groups today ahead of fellow Swede Nisse Kjellström, and Norwegian Elias Ishoel. The Saturday racing will likely be tight as the top 3’s fastest lap times were only separated by less than 3 tenths of a second. The fastest three of the women were 2016 Champion Marica Renheim, who missed the 2017 event with injury, led the way as Malene Andersen and Emilia Dalhgren were second and third fastest. Meanwhile in the European Championship the 2 groups of qualifying ended with Norway’s Ole Herman Sjøgren as the fastest after recording a 43.91 lap time over Sweden’s Pär Vikman and Emil Sundvisson. In terms of TV coverage, Youthstream has a crew of TV staff onsite to document the event. The world can tune into www.MXGP-TV.com to watch the 26 min Magazine of the 2018 FIM Snowcross World Championship the week following the event. Be sure to stay tuned to www.worldsnowcross.com and the MXGP social media channels to for more on TV Coverage and the event as a whole. Snowcross World Championship Qualifying Practice Group A: 1. Adam Renheim (SWE, Ski-Doo), 0:40.645; 2. Elias Ishoel (NOR, Ski-Doo), +0:00.243; 3. Kristoffer Holm (NOR, Polaris), +0:01.282; 4. Emil Harr (SWE, Lynx), +0:01.423; 5. Martin Moland (NOR, Arctic Cat), +0:01.485; 6. Joonas Keskiaho (FIN, Lynx), +0:01.779; 7. Marcus Ogemar (SWE, Ski-Doo), +0:02.407; 8. Viktor Herten (FIN, Polaris), +0:02.563; 9. John Stenberg (SWE, Lynx), +0:02.636; 10. Filip Öhman (SWE, Lynx), +0:04.682; 11. Dmitriy Sklyarov (RUS, Lynx), +0:07.578. Snowcross World Championship Qualifying Practice Group B: 1. Nisse Kjellström (SWE, Arctic Cat), 0:40.869; 2. Aki Pihlaja (FIN, Lynx), +0:00.936; 3. Balder Näs (SWE, Arctic Cat), +0:02.055; 4. Oskar Norum (SWE, Polaris), +0:02.194; 5. Adam Öhman (SWE, Lynx), +0:02.211; 6. Mikko Osmo (FIN, Lynx), +0:02.307; 7. Magnus Reiten (NOR, Lynx), +0:02.780; 8. Jarno Hietalahti (FIN, Ski-Doo), +0:03.052; 9. Roy Ylä-Onnenvuori (FIN, Lynx), +0:03.676; 10. Pieti Puhakka (FIN, Polaris), +0:04.419. Women’s World Cup Qualifying Practice: 1. Marica Renheim (SWE, Ski-Doo), 0:45.238; 2. Malene Andersen (NOR, Arctic Cat), +0:00.243; 3. Emilia Dahlgren (SWE, Polaris), +0:03.093; 4. Jenny Lundström (SWE, Lynx), +0:04.254; 5. Susanna Lemström (FIN, Lynx), +0:04.599; 6. Matilda Johansson (SWE, Lynx), +0:04.836; 7. Birgitte Olsen (NOR, Lynx), +0:04.910; 8. Matilda Norberg (SWE, Ski-Doo), +0:05.707; 9. Taru Kylmälä (FIN, Lynx), +0:06.237; 10. Fanny Vikström (SWE, Lynx), +0:06.816; 11. Elvira Lindh (SWE, Arctic Cat), +0:07.128; 12. Carolina Wärn (FIN, Lynx), +0:07.384; 13. Julia Mosshäll (SWE, Polaris), +0:08.849; 14. Veera Virtanen (FIN, Lynx), +0:11.852. All the photos from the event will be available HERE and by clicking HERE you will be able to obtain the complete results. Women’s World Cup Free Practice 10:55; World Championship Free Practice 11:15; European Championship Warm up 11:50; Women’s World Cup Warm up 12:15; World Championship Warm up 12:40; European Championship Race 1 13:40; Women’s World Cup Race 1 14:15; World Championship Race 1 14:50; European Championship Race 2 15:50; Women’s World Cup Race 2 16:25; World Championship Race 2 17:00.